I recently learned that the SANS Institute, a leading IT Security training and certification organization, has a Call for Papers (CFP) for an upcoming one day workshop on securing the "Internet of Things". 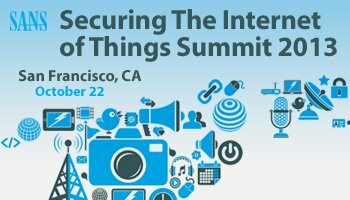 The event is the Securing the Internet of Things Summit, being held on October 21st in San Fransisco. The page has full info on the event, including the CFP. The event sounds pretty good. I'd love to be there, but most likely won't be able to. I do hope that the papers presented will be available to others. (say a conference report or the like).